To participate in the campaign and organise an event, we invite you to join the existing partnership in your country. Click here to check the list of partners. If your country doesn’t have a partner, you can still participate – organise an event independently and let us know about it. 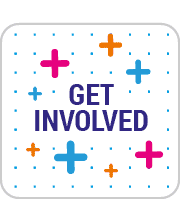 You don’t have an organisation but still want to get involved? You can organise your own little training and help your relatives, friends or colleagues to help them with technology. What event could it be? Anything on the topic of the campaign from the conference, exhibitions, contests, to hackathons, testing digital skills level, workshops, training sessions and webinars. See some examples of activities HERE. 1. Spread the word about the campaign and invite others to join! Don’t forget to use the ALL DIGITAL Week banners and logos in your posts and announcements. We are collecting teaching activities from our long-standing partners, so more activities and resources will be added. You can also browse previous editions and reports of the campaign (links in the top menu) and learn about what our partners did in various countries before. 3. Add your training announcement to the map of events (you need to register on the website to add an event). Remember that you can always get back to the event and update it and also tell us about it in the same form after you conduct the event. 4. Conduct the event and don’t forget to take pictures! 5. Tell us about this event after you conduct it. Go back to the same form on the map of events that you used for planning (that is why we ask you to register) and update it. Please add the real number of participants, the overall description and the photo(s) from the event. In the description you can share what participants have learned, what went well, what was challenging; you can also add participants’ feedback and your own impression of the event. >> At the bottom of the form don’t forget to change the status of your event from ‘planned’ to ‘conducted/completed’. We also encourage you to write public blogposts about the events on our community website unite-it.eu. You can see the the best events from 2018 and their descriptions in this blogpost. 6. You will get a personalized certificate for organising the event after your conducted event is approved. You will receive it by email to the same account that you used for registering on the website. 7. Win a trip to the ALL DIGITAL Summit 2019 in October! All conducted events automatically enter a contest for the best events. The best events will be selected by a jury consisting of ALL DIGITAL staff and Board members, based on a combined set of criteria, including quality of content, participation, event media impact. Three winners will be invited to attend the ALL DIGITAL Summit in October 2019 in Italy. This annual event brings together leaders from digital competence networks and organisations working to enhance digital skills to share and learn from each other. Learn about the winners of ALL DIGITAL Best Event 2018 celebrated in Brussels. 8. 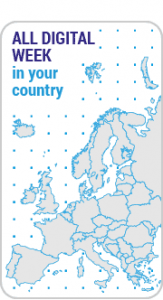 IMPORTANT: Enjoy being part of the pan-European ALL DIGITAL Week!